One year ago, Hurricane Maria smashed directly into Puerto Rico as a Category 4 storm near peak intensity. With the fuller picture we now have of the humanitarian crisis that followed, it’s clear that few weather events have done as much damage to US citizens and infrastructure as Maria did to Puerto Rico. Though the island has received more than $25 billion in aid and is gradually rebuilding, the initial response stands as a stark example of faltering and poor coordination among federal and local officials. Because of the failure at the highest level of government — all the way up to President Donald Trump — to consider the severity of the looming crisis before the storm hit and to take critical steps to mitigate it, the disaster was far worse than it had to be. While Trump has insisted that “we did a fantastic job in Puerto Rico … I think most of the people in Puerto Rico really appreciate what we’ve done,” a recent Washington Post/Kaiser Family Foundation poll found that eight in 10 residents there give negative marks to Trump; seven in 10 give negative marks to the Puerto Rican government’s efforts; and two-thirds are displeased with Democratic Gov. Ricardo Rosselló’s response. The island’s infrastructure was weak and vulnerable to storms well before Maria. But the government’s efforts to respond were slow, insufficient, and lacking transparency. Patchy electricity and cell service plagued the island for months. Remote rural villages were completely cut off from all services after the single roads to them were mangled by the storm. The death toll from the storm at first appeared to journalists to be in the hundreds (though not to officials, who insisted it was at most 64). But as the blackout dragged on and health care remained strained for months, the number climbed higher and higher. In August, we learned from researchers at George Washington University, who conducted the most comprehensive study on the question to date, that the best estimate is that 2,975 people died as a consequence of the storm. Yet Trump has refused to acknowledge this extraordinary toll for which he is partly responsible. In a series of tweets last week, he rejected this figure, claiming it was a plot by Democrats to make him look bad. With the one-year anniversary of the storm on Thursday, Maria’s larger impact on America is starting to come to light. Here are some of the biggest outcomes from the hurricane: what changed, what didn’t, and what we know about how the storm is shaping the future of Puerto Rico — and the rest of America. 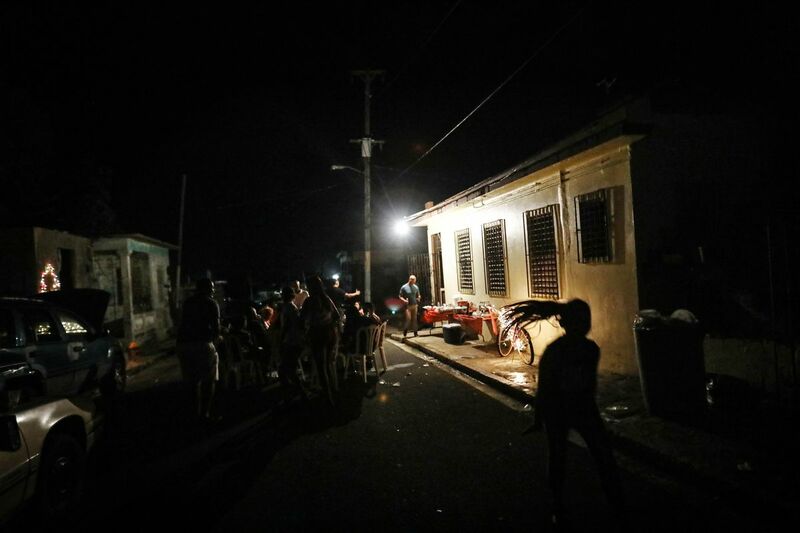 A car battery connected to an inverter and a generator provide power for a makeshift street party, on a block without electricity, on December 24, 2017, in Rio Grande, Puerto Rico. Hurricane Maria’s 175 mph winds uprooted much of Puerto Rico’s energy infrastructure. More than 80 percent of the island’s power lines were knocked down by the storm, leaving 3.4 million Americans in the dark. It was only a matter of time before Puerto Rico experienced a major outage given that the island’s power grid suffered for years under poor funding, neglect, and outdated hardware. But the blackout lingered for months because of a failure to properly prepare and adequately respond at all levels of government. When states like Florida and Texas saw that hurricanes were heading toward their shores, power companies in those states invoked mutual aid agreements with utilities elsewhere, marshaling thousands of line workers before the storms made landfall. The Puerto Rico Electric Power Authority, citing financial constraints, declined to do something similar. Instead, it opted to sign piecemeal repair contracts after the storm already struck, including hiring a little-known, barely experienced private contractor in a deal fraught with allegations of corruption that in turn triggered a federal investigation. Meanwhile, the Federal Emergency Management Agency went back and forth over when it would leave the island and had its own issues with private contractors supporting the reconstruction effort. The federal government allowed a waiver of the Jones Act, a shipping regulation that made bringing goods to Puerto Rico more expensive, to expire, raising the costs of rebuilding. Melquiades Castellano with her cancer, high blood pressure, and circulation pills on September 30, 2017, in San Juan, Puerto Rico. Castellano had to skip some of her pills because of lack of food to take with them. 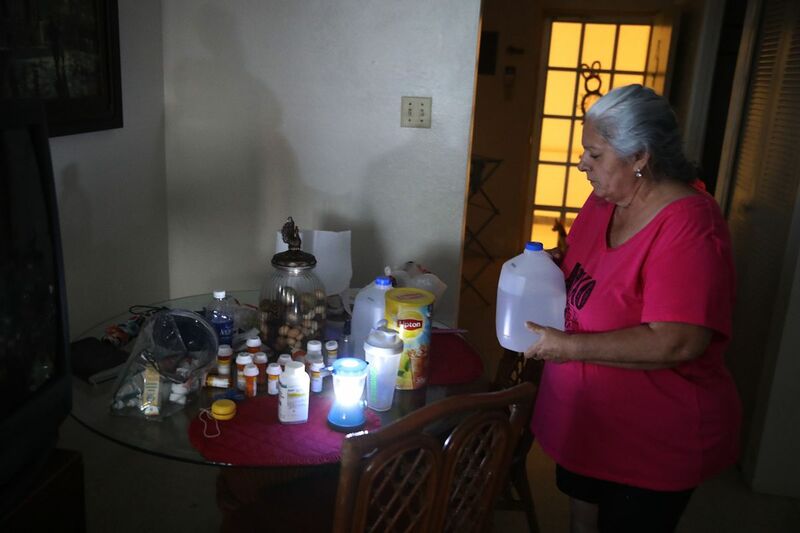 While bureaucrats bickered, the island’s residents were soon shrouded in the largest blackout in US history and the second-largest in the world on record. Without electricity, Puerto Ricans sweltered under a heat wave. Food spoiled. Lights went out. Gasoline fumes filled the streets as generators rumbled to deliver sparks of power. More than an inconvenience, the outage triggered a health care crisis. Vital medical equipment like dialysis machines couldn’t run. Medicines like insulin went bad. Perhaps most critically, water pumps shut off. That forced some residents to drink from contaminated sources. Sanitation networks failed, helping feed a leptospirosis outbreak. As Oxfam, one of the many nonprofit groups that responded to the humanitarian emergency in Puerto Rico, noted in a report published September 16, “Water is one of the most basic human needs: every person interviewed for the Oxfam study said that being without water was much worse than being without power.” Women, who carry out many household tasks, were particularly affected by the lack of water, Oxfam found. Once the storm passed, the blackout presented a blank slate to rebuild Puerto Rico’s grid with an eye toward resilience and cleaner energy. The island relies on imported fuels, but entrepreneurs seized the opportunity to showcase renewables and distributed power systems as ways to make Puerto Rico better withstand future outages. Some facilities like hospitals and fire stations now generate their own power from solar panels and distribute it across microgrids. Puerto Rican officials have endorsed using more of these technologies to make the island more self-sufficient. After 328 agonizing days, power was finally officially restored to the whole island in August. But the situation is fragile. Many of the repairs are meant to be temporary, and the island’s power lines, generators, and substations remain vulnerable to another storm. And the last household to get power back soon suffered another outage, a reminder of just how unreliable the electricity grid remains. 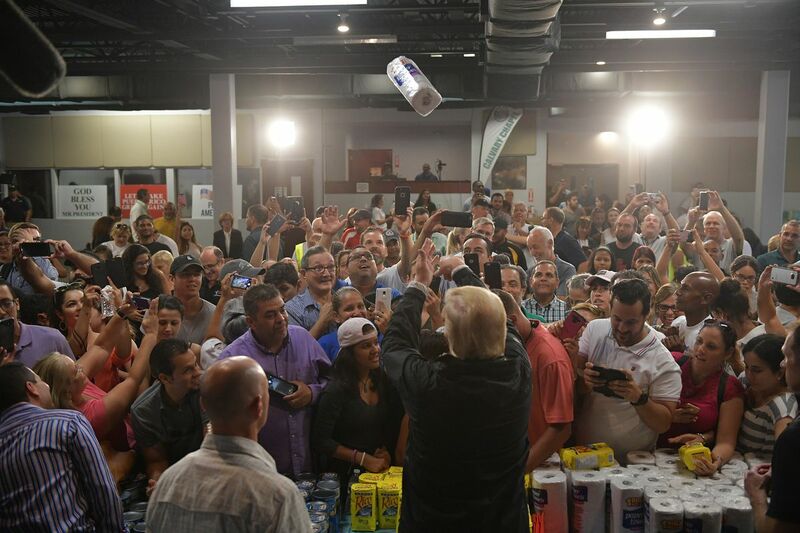 President Donald Trump throws a paper towel roll as he visits the Cavalry Chapel in Guaynabo, Puerto Rico, on October 3, 2017. Hurricane Maria provoked a mass exodus from Puerto Rico that has only recently begun to slow down. Tens of thousands of Puerto Ricans have joined relatives on the US mainland, moving to states like Florida and New Jersey. Many have no plans to return. New data from the Puerto Rico Institute of Statistics shows that a net total of 150,000 people left the island in fiscal year 2018. That’s about twice the average migration from the previous two years, when roughly 90,000 Puerto Ricans left, mostly to escape Puerto Rico’s economic crisis. Central Florida remains their top destination. Nearly 12,000 children from Puerto Rico were enrolled in the state’s public schools between December 2017 and February 2018 — a 12 percent increase from the same period the year before. The Puerto Rican community in Orlando has grown rapidly in recent years, fueling speculation that another wave of migration could impact Florida’s swing vote in the midterm elections. As US citizens, Puerto Ricans can vote in national elections if they live on the US mainland. So far, there is little evidence that the influx has triggered a surge in new voter registrations in Florida. Some families are still struggling to settle down. This month, more than 300 Puerto Rican families in Florida were kicked out of the motels where they’ve been living after FEMA canceled housing aid to hurricane survivors. Whether hurricane survivors will register to vote and turn out to the polls in November remains unclear, but there’s no denying that Hurricane Maria is playing a major role in the state’s competitive midterm elections. 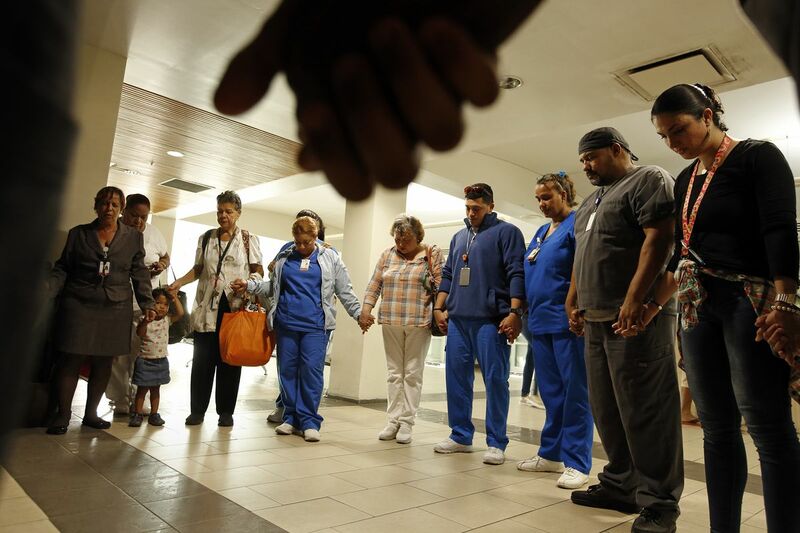 Hospital employees and nurses gather to pray for a co-worker who was critically injured in a violent attack during the chaos post-Maria. Hurricane migration may not have created a surge of new voters just yet, but Florida’s 1.2 million Puerto Rican residents still wield considerable political power. The Puerto Rican population is expected to soon surpass the Cuban diaspora as the largest Latino group in the state. Cuban voters have long been a reliable Republican voting bloc, but Puerto Ricans lean toward Democrats. And that’s making Republicans nervous. The GOP’s anxiety became clear last week, after Trump claimed that Hurricane Maria’s death toll of 2,975 was fake. Two of the president’s Republican allies in Florida jumped to denounce him. Winning over Puerto Rican voters is now a focus in the battle over Nelson’s Senate seat, considered one of the tightest congressional races in the country. Scott has spent millions of dollars airing Spanish-language television ads, including one in which he touts his support for Puerto Ricans and highlights his seven trips to the island after the hurricane. In his latest Spanish ad, the Republican governor tries hard to distance himself from Trump, who remains deeply unpopular among Puerto Rican voters. “When I don’t agree with what President Trump does or says, I’ve said it. My only commitment is to you,” Scott says in his cringe-worthy Spanish. Democrats are counting on Puerto Ricans’ anger toward Trump to turn them against Scott, who scores high in public opinion polls. About 80 percent of Puerto Ricans living in Florida have a favorable opinion of Scott, according to a Florida International University poll of 1,000 people in May. However, about 57 percent said they would probably vote for Democrats in November. The stakes are high, and the Puerto Rican vote is now crucial. Hurricane Maria may end up changing national politics, and there are signs that it’s changing politics in Puerto Rico too. Hurricane Maria brought into sharp focus the human impact of Puerto Rico’s status as a US territory. The storm’s deadly aftermath, and Trump’s callous response, forced thousands of Americans to pay attention to Puerto Rico for the first time. Many had no clue that millions of US citizens lived on an island that belongs to the United States but is not wholly a part of it. Since Puerto Rico is a US territory, Americans living there have no real congressional representation and can’t vote for president in general elections. Their lack of political power made it easy for Trump to dismiss the human suffering that unfolded on the island. All of this has ended up reviving Puerto Rico’s push to become the 51st US state. On Wednesday, Gov. Rosselló sent a letter to Trump, strongly urging him to consider statehood for the island, according to the Hill. “As we revisit all that we have been through in the last year, one thing has not changed and remains the biggest impediment for Puerto Rico’s full and prosperous recovery: the inequalities Puerto Rico faces as the oldest, most populous colony in the world,” wrote Rosselló, who campaigned for governor on a pro-statehood platform. A House bill that would allow Puerto Rico to become a state has dozens of signatures so far. In June, Puerto Rico’s nonvoting congressional delegate, Jenniffer González-Colón, introduced the bipartisan bill, which would admit Puerto Rico as a state by 2021. With 53 co-sponsors, the Puerto Rico Admission Act represents the most support Puerto Rico has gotten in Congress for statehood, but Republican leaders have yet to put the bill up for a vote. This is Puerto Rico’s most aggressive push for statehood yet. About 97 percent of voters in Puerto Rico cast ballots in favor of statehood during a referendum on the issue in June 2017. However, only about a quarter of registered voters turned out to the polls. 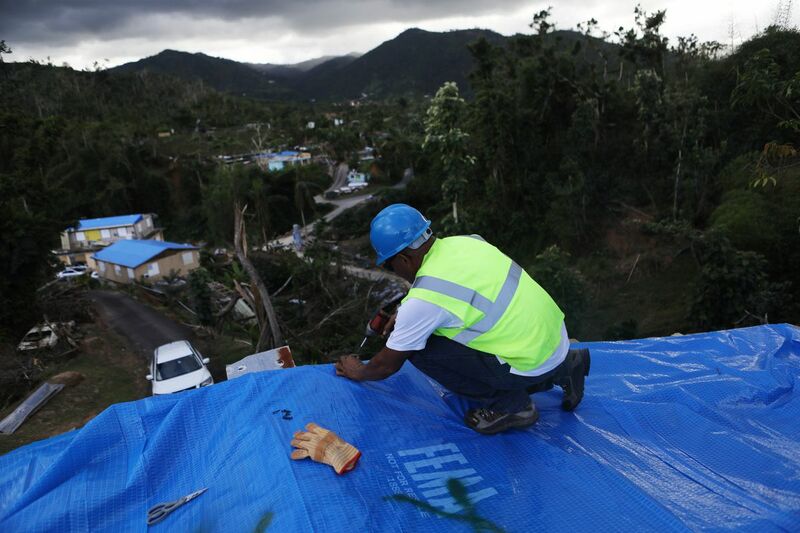 A contractor applies a FEMA tarp to a home damaged by Hurricane Maria in Puerto Rico on December 20, 2017. The issue of statehood has long divided Puerto Ricans, but the hurricane may have shifted views among some survivors. A new survey shows that Puerto Ricans who remain on the island favor statehood over any other option. About 48 percent want Puerto Rico to become a state, 26 percent would rather remain a US territory, and 10 percent want full independence. About 16 percent were unsure or declined to answer. The survey, conducted by the Kaiser Family Foundation, included responses from about 1,500 households across Puerto Rico after the hurricane hit. The survey shows that there is still some division among Puerto Ricans, but they did agree on one thing: that the federal government would have responded to the hurricane differently if the island were a state. The White House on Thursday called the recovery “historic,” and indeed, FEMA has never before had to figure out how to rebuild an entire island. But Puerto Ricans on the island “remain highly vulnerable to any new shock,” as Oxfam has noted. So next time, let’s hope the government will do better.